What could you do with up to 6% more power!!! AND NOW…. the new Kontrol with The SOLESTAR Stabilisation-Delta – SOLESTAR KONTROL cycling insoles can be worn in any cycling shoe comfortably without any further customization simply by choosing the right shoe size.The SOLESTAR insoles are based on a highly innovative and patented concept, the Stabilization Delta. The Stabilisation-Delta works like a clamp in your cycling shoes: with its three main contact points it provides strong support for the foot during the entire pedaling cycle. The foot is brought into the optimal neutral position for power transmission and then held there for the duration. 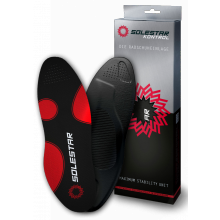 SOLESTAR insoles have been specifically developed for cycling. The innovative and patented Stabilization-Delta of the SOLESTAR cycling shoe insoles maximize the riders performance by stabilizing the foot, reducing the recurrent shear forces, and optimizing body posture. Off the rack, match to your cycling shoe size and insole, ride away with a pair. – custom cycling insole dealer. *A NEW LEVEL OF CYCLING INSOLE – up to 6% more power. Book an appointment for a fitting, ride with added power 10 days later!